Maple Leaf-shaped Dish - Homespun Autumn Discounts Apply ! 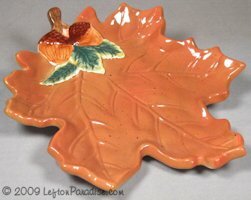 A Homespun Autumn maple leaf-shaped dish, measures 8.5 by 10 inches. Decorated with acorns and pine needles, it has no flaws or cracks.